I am pleased to report that I will be speaking at two international wine congresses in Milan, Italy next month. 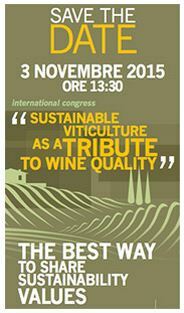 I’ll be speaking at the International Congress on Sustainability “SUSTAINABILITY AS A TRIBUTE TO WINE QUALITY” on 3rd November 2015 and “DISCOVER THE SENSORY FACTORS” on 4th November 2015 during the 26th edition of SIMEI – International Enological and Bottling Equipment Exhibition in Milan, Italy. This event is sponsored by the Unione Italiana Vini, an association of Italian wine producers whose 500 members account for 70% of the nation’s wine. The congresses feature innovative and interactive programs and an impressive group of speakers and participants. I am very pleased to take part! Here is a description taken from the conference website. “The Congress will develop two different but strictly connected topics and will involve the most authoritative international experts of the scientific community. Prominent personalities have already been invited to participate in two complementary Steering Committees, chaired by two recognized international icons, the likes of Ettore Capri (Opera Research Centre- Università Cattolica del Sacro Cuore) and Anita Oberholster (Enology Department of Viticulture and Enology- UC Davis). Here are two videos that explain the international congresses and another that shows what SIMEI is all about. Thanks, Paul. I will be speaking from notes not a prepared text, but I will keep your invitation in mind if I write up my comments. Thanks again! Finally! It will be a real pleasure to meet you Mike. I’m organizing the gala dinner for the Simei (on the 4th)! Is it possible to meet you in Milan? Or a dinner together (not on the 4th…)? That’s great news, Alessandro. Sue and I will be at the gala dinner and we will be staying on for a few days, so we should have time for a dinner before we leave.